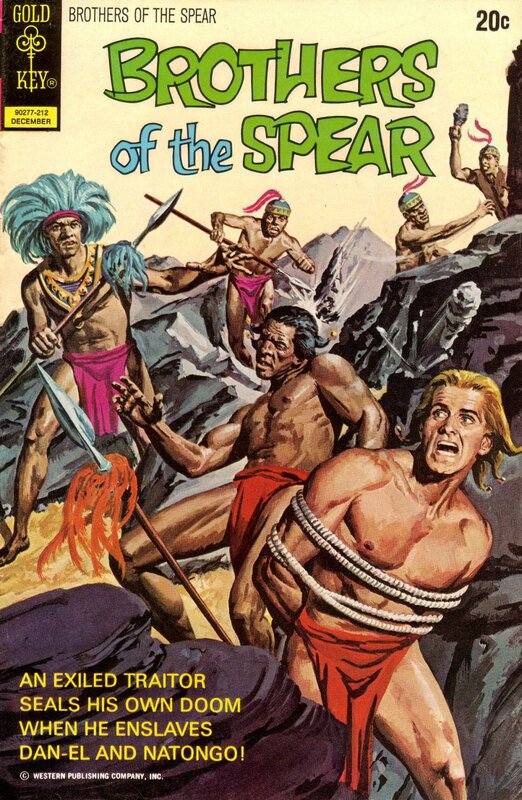 Postal regulations required that a few pages of the Dell Tarzan comic books which began in 1948, be devoted to features other than that featured on the covers. They started by running back-pages features such as "Mabu," "Two Against the Jungle," and "Boy." 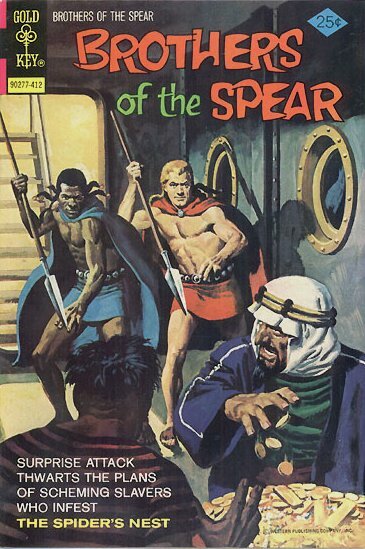 Eventually this led to "Brothers of the Spear," a very successful series that debuted in issue 25 (October 1951). 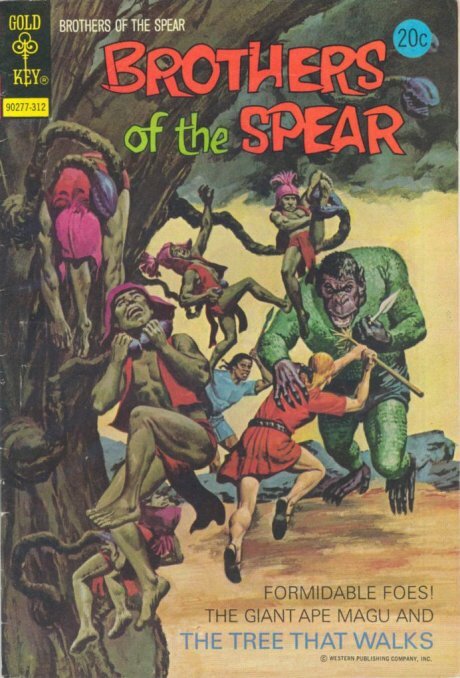 The serial, created by the prolific Gaylord DuBois and Tarzan artist Jesse Marsh, went on to run in each issue for over 25 years. 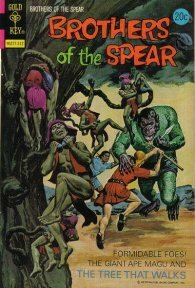 Comic art legend, Russ Manning, did some of his earliest comics work in this series -- beginning with Tarzan issue #39 and drawing each feature until he took over the main Tarzan art from Jesse Marsh in Gold Key issue 154. 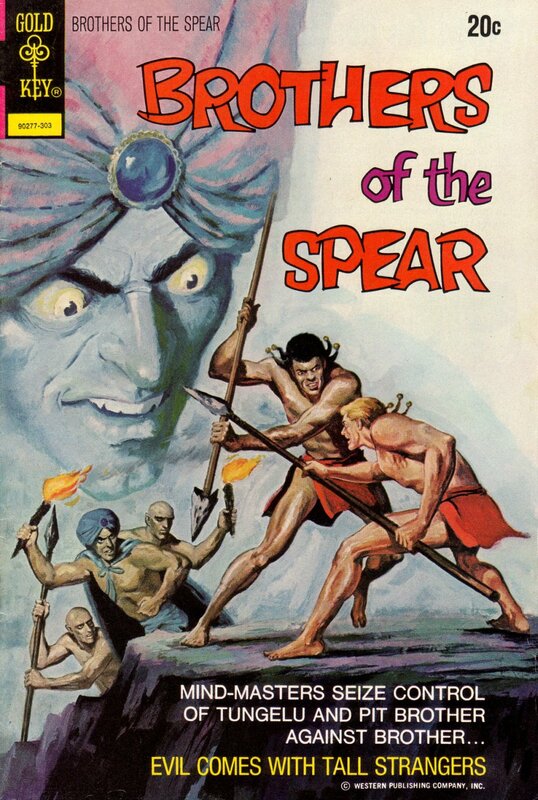 The feature appeared sporadically after this with occasional art by Manning and Mike Royer. The Brothers of the Spear were Dan-El (white) and Natongo (black), unrelated kings by right in their neighboring countries (Aba-Zulu and Tungelu), whose thrones had been usurped. 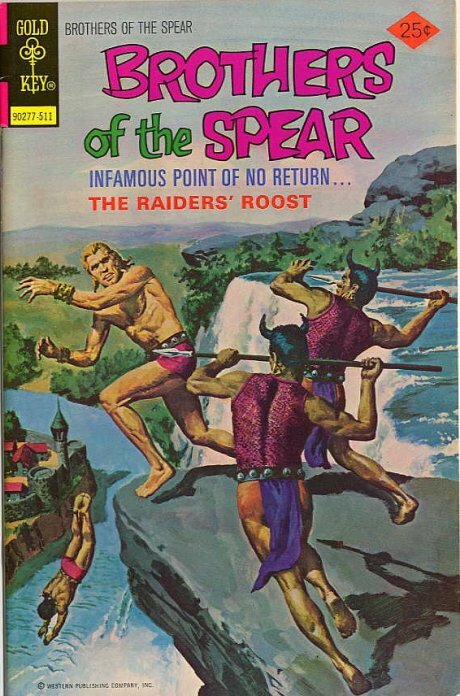 They swore brotherhood and had many adventures together. This was probably the first appearance in American comic books of a pair of white and black heroes sharing adventures. 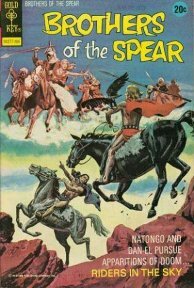 By the time they had been restored to their respective thrones, both were married to beautiful mates, Dan-El to Tavane and Natongo to Zulena. 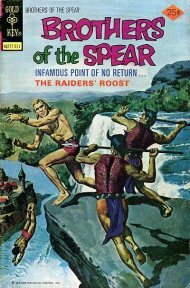 Their love of action continued, however, and they went on to many more years of adventure. 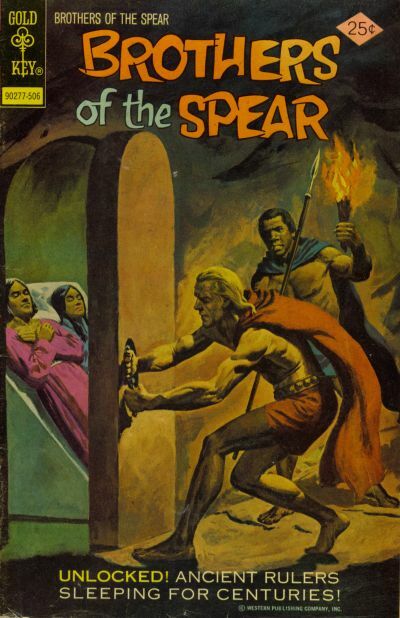 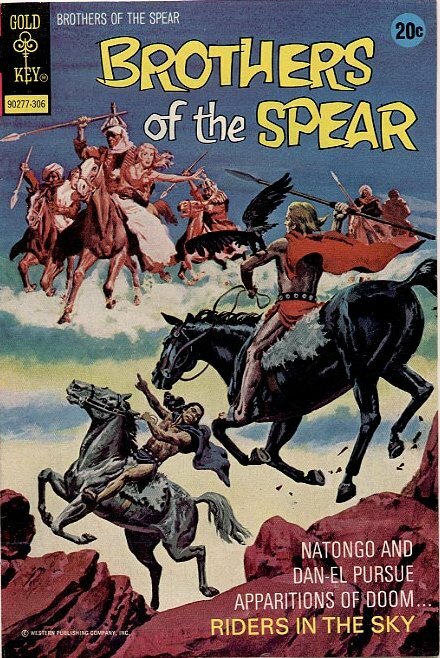 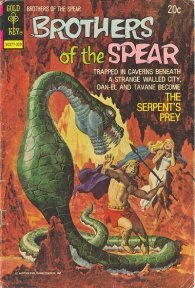 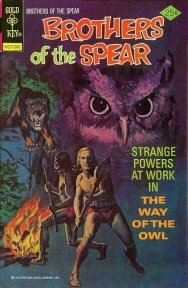 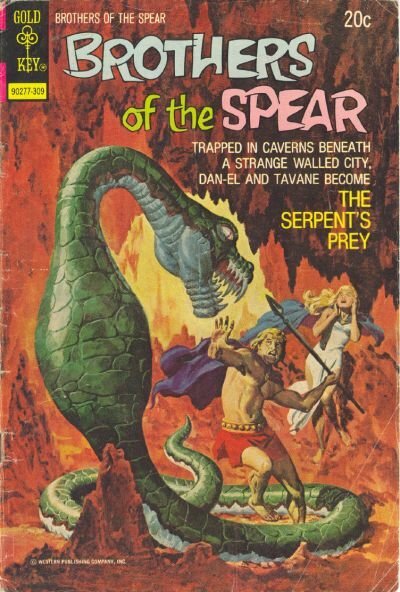 Gold Key Comics published their own stand-alone 17-issue Brothers of the Spear title from June 1972 through February 1976. 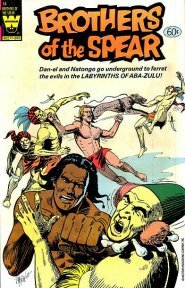 Whitman Comics published an issue #18 in May 1982, with reprinted material only. 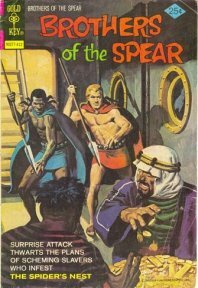 Du Bois wrote the series beginning with issue #2. 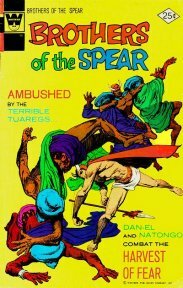 Jesse Santos did the artwork for the first twelve issues, followed by Dan Spiegle. 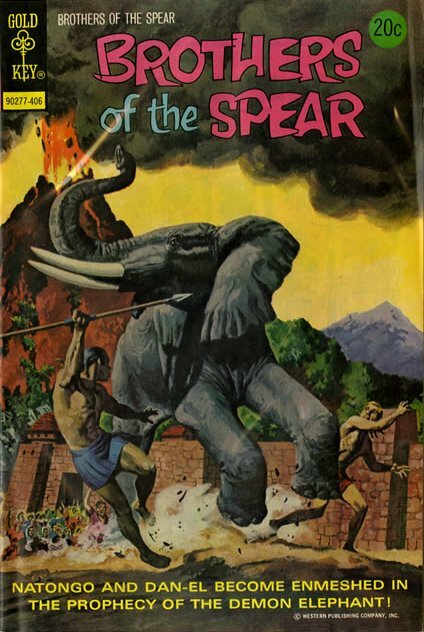 GOLD KEY 158 ~ Tembo! 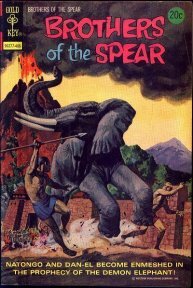 Tembo! 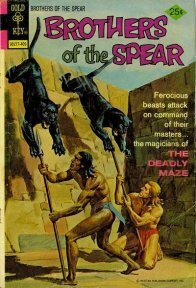 GOLD KEY 201 ~ Disaster! 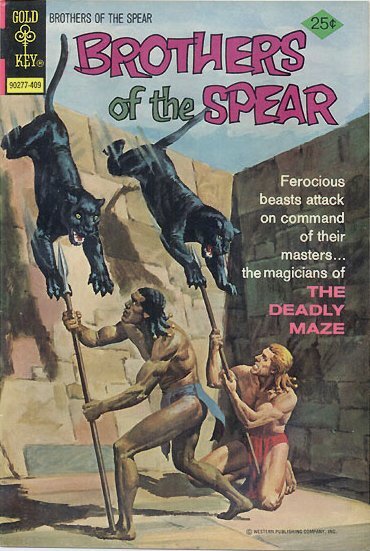 GOLD KEY 202 ~ The Pit ***New? 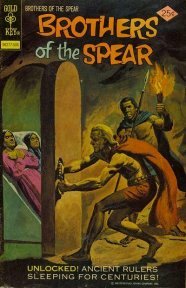 GOLD KEY 203 ~ The Silent Ones ***New? 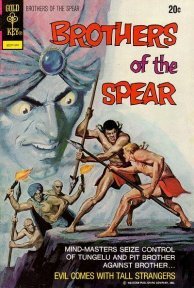 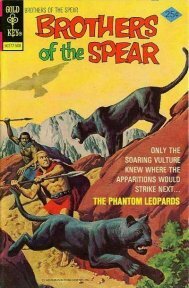 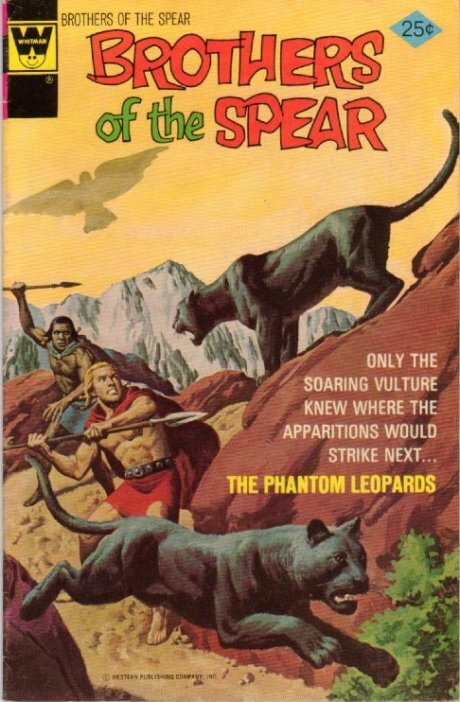 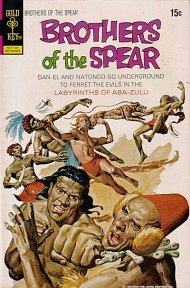 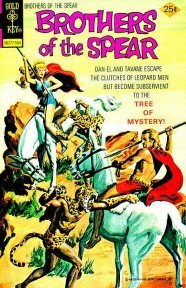 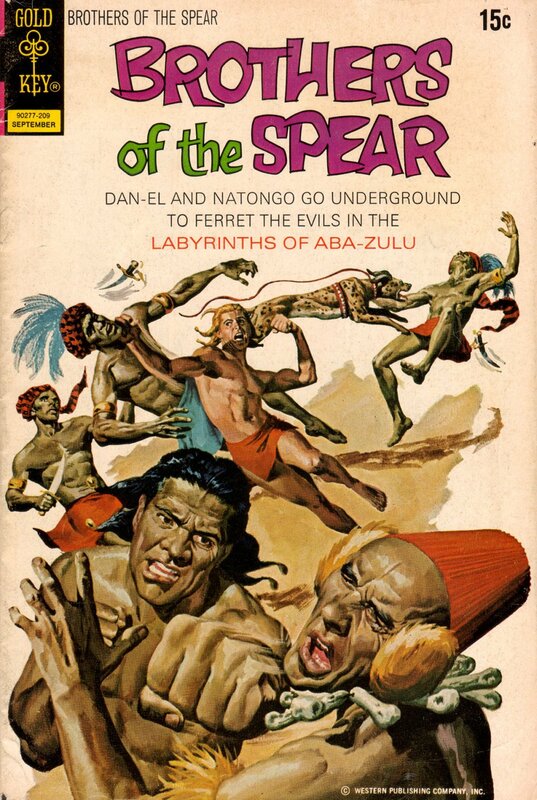 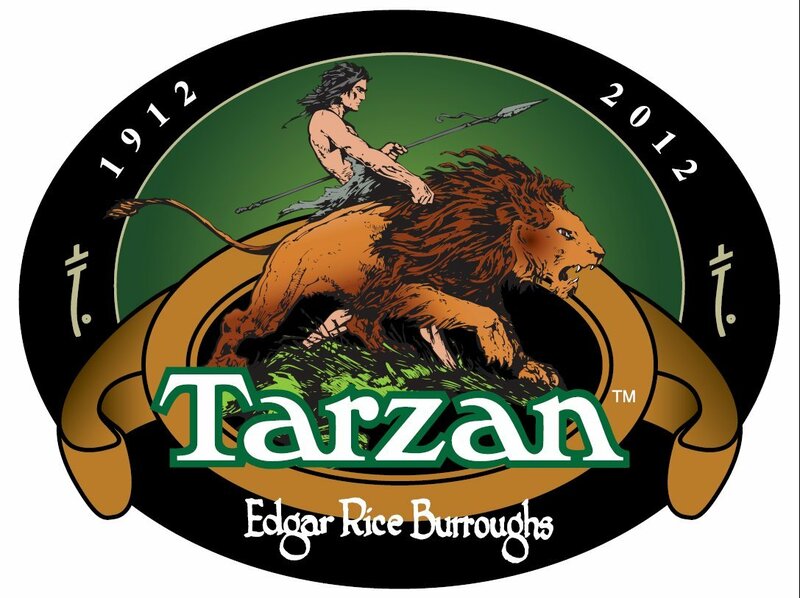 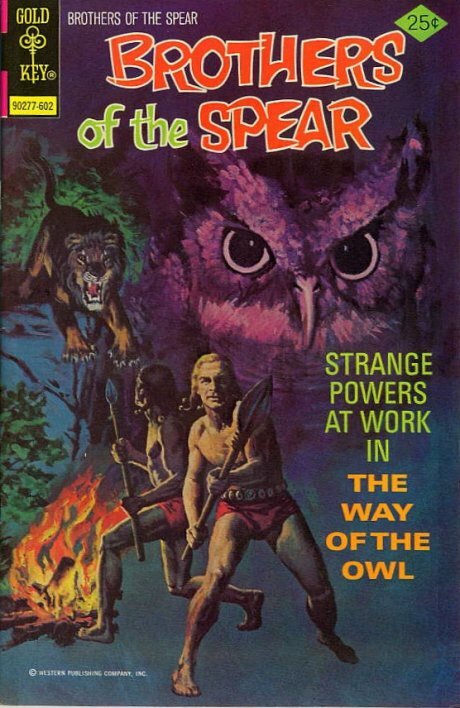 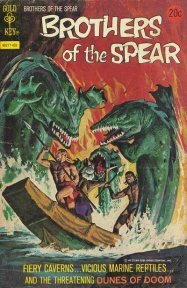 The Tarzan title was taken over from Gold Key by DC Comics in 1972, but Brothers of the Spear was not a property of Edgar Rice Burroughs, Inc. and the title remained with Gold Key. 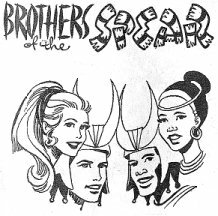 Gold Key then brought out Brothers of the Spear in their own title with artwork by Jesse Santos. 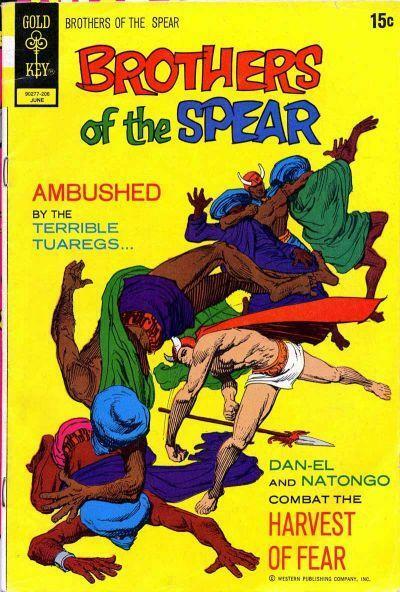 The Brothers of the Spear comic continued until #17 (February, 1976), then one final issue came out in 1982.